What Kelly Did… Jam Jars, Bean Tins and Ice Cream Cones. The plan is, the day before the wedding (pre manicure of course), with the help of friends and family, to make arrangements with flowers bought from a local wholesaler then place around the reception room to make it look pretty. Along with my collection of jars, I also have a collection of baked bean tins. Yes my colleagues may mock, but who else can boast a pretty pastel stream of tins billowing in the wake of their getaway car? Yep I am sad enough to have spent night after night painting baked bean tins. To do this, I bought a pot of white gloss paint and some tester pots of matt paint, mixed a small drop of the latter with the gloss to get the right shade and painted. And painted. If Carlsberg DID do housemates, Cath Kidston would be mine. Although Andy is not a massive fan of the prints and polkas (I find guys don’t always “get it”), it hasn’t stopped me adding a few florals to the day. Because we are having white linen and white chair covers, to inject a bit of colour into the reception, I decided to make some table runners. I bought two sets of curtains, cut each panel into 3 strips and edged each strip with some lace trim purchased from eBay. 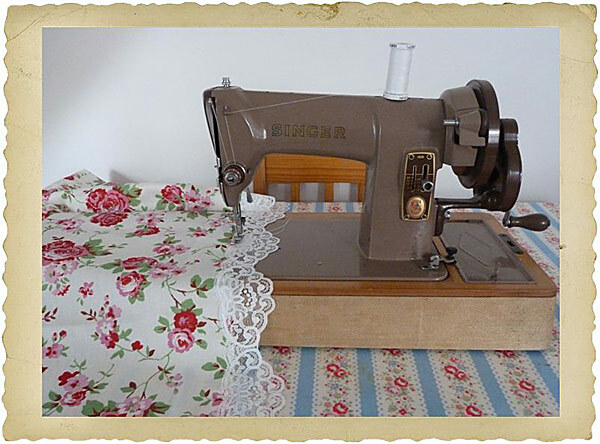 Don’t laugh at my sewing machine; it’s an oldy but a goody! The flower side of wedding day planning took a bit of a back seat to be honest. Don’t get me wrong, I think flowers are an important part of THE day, however, with running the risk of sounding a little ‘nuts’, I realised that I would never have, ahem, full control on this aspect i.e. you say what you like, show a few pictures then you put your trust in that person to create your ‘vision’ on the day. So with 6 months to go, we (Andy) decided it was about time we got something sorted. A tap, click and a Google search later, we had lined up a meeting with a florist. Now, by no means do I class myself as an expert in all things floristry, but I’m no mug either. Despite choosing a lot of Gypsophilia (cheap) and hydrangea (big flower head things = budget friendly), a few days after the meeting the florist quoted us a somewhat, erm, ‘exuberant’ price. We were a tad surprised as judging by the conversations we had had at the meeting, we were expecting something quite different. After a tactful questioning (inquisition) by email later, I still wasn’t happy. A tap, click and a Google search (take 2) later and I came across Green Flowers. Not only is their concept brilliant; they source from local growers, use ethically produced products and where possible they deliver by bicycle (how cool is that?? ), but their prices were a lot more reasonable too. Despite not meeting in person (this is arranged for next month), I felt confident in handing over our deposit and putting a big fat tick next to ‘florist’ on the to-do-list. Coupled with a few ideas I have for the Church, all in all I am very happy. 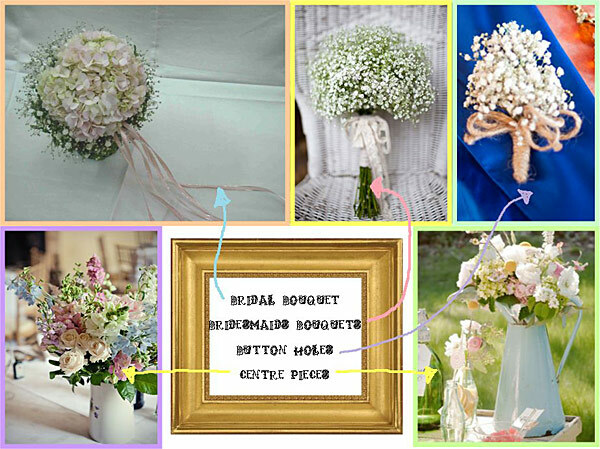 Interesting fact alert; the groom often chooses a flower for his buttonhole which also occurs in the bride’s bouquet. This is a vestige of the time when a Knight would wear his Lady’s colours to display his love (you learn something new everyday and all!). I have a terrible habit of turning up to a wedding having had breakfast but no lunch. Come post ceremony I’m starving and I’m one of those people trying to strategically place themselves so that they can catch the canapé tray on the way out and back in to the kitchen whilst Andy tries to pretend he doesn’t know me. So, with the budget running tight, canapés seemed like an expensive option when really they are just the fancy equivalent of cheese and pineapple sticks or cocktail sausages. 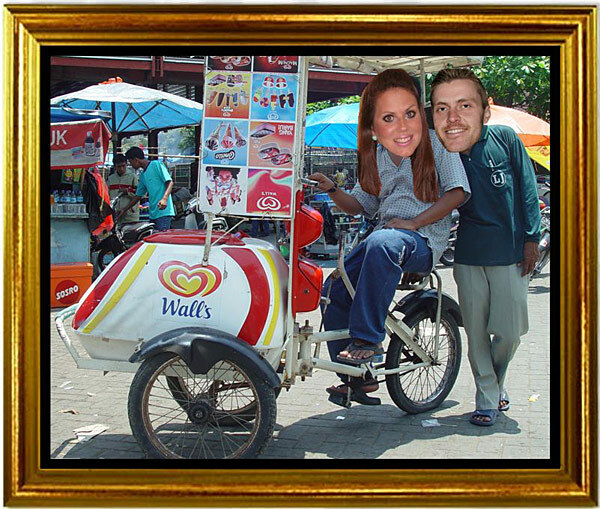 With a bit of research and weighing up of options, we decided to venture down the route of serving ice cream. So that’s about it for this post folks. I would love to hear about some of your own DIY projects you’ve got going on. 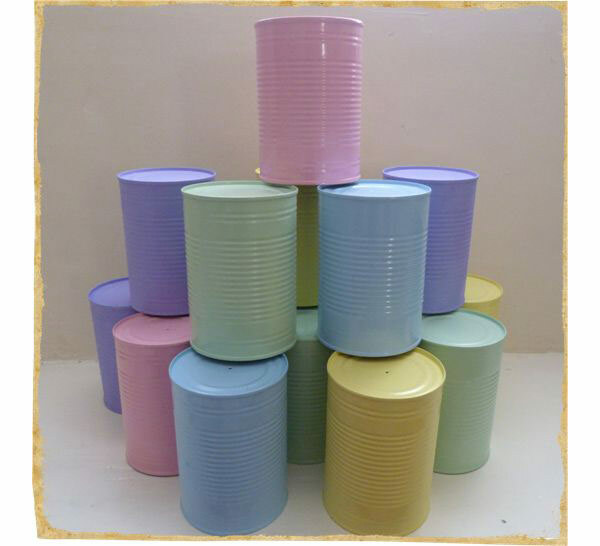 I want some baked bean tins painted in yummy sorbet pastel shades. I am sat in foggy Manchester and they would brighten my day significantly. I have been collecting baked bean tins for some time now so am fully aware of the strange looks from work collegues when you tell them what you’re up to. I had NEVER thought of painting them though and these look amazing. Think I might be hitting Homebase on the way home tonight! The tins in pastels is a lovely idea – I think Adam and I will be stealing that one! Rum and Raisin ice cream is A-MAZING!!! You must try it….YUUUUMMMM!!!! Ah i love everything about this post! Pastel tins, Cath Kidston, Ice Cream and Polaroids… My personal favourite ice cream flavour is traditional vanilla although i am partial for lemon sorbet if i can ever get my hands on it! PS. The sewing machine is truly amazing! Rum and raisin – ugh. Ha ha ha I think urgh to rum and raisin too! my favourite is the honeycomb one from Thorntons and Ben and Jerry’s Phish Food..just in case anyone’s remotely interested. This is my first RMW comment… I have been addicted to your website ever since I got engaged a year and a half ago…I’m getting married in two weeks! Ahhh! I wanted to reply to this DIY special post as I too have been upcycling jam jars! I have wrapped mine with jute string and different ribbons and lace, they make such lovely vases and they’re free!!! I’ve also been doing a lot of sewing… love the sewing machine btw! I have been doing lots of bunting to decorate our marquee and some hessian bunting for the top table! I totally love the pastel tins! Gorgeous! Oh and… Gypsophilia is the way foward!!! Kelly welcome to the dark side of addictive and repetitive wedding DIY! And what a delightful set of projects you’ve produced!!! I love them all!!! I have also been scrubbing jam jars for AGES!!! Haven’t started to decorate them yet though! Loving your ideas!!! I was also looking into ice cream, but we’ve run out of pennys! Although there is a ice cream hut right outside our ceremony venue (because it’s right on the seafront!) So maybe people might just help themselves!!! Oh and Rum and Raisin is YUK! I’m more of a traditional lass when it comes to the cold stuff! Strawberry, vanilla, chocolate or mint choc chip if I’m feeling brave! I love this post and all your lovely ideas! And I think the pastel bean cans are A-mazing!! Oh no, I feel some baked bean tin collecting coming on – they look fantastic, and a great way of bringing colour to the table. Am such a fan of…pretty much this whole post! I’m partial to the upcycled jam jar however I don’t think I can be bothered with all the collecting and scrubbing etc…a quick google has revealed that you can purchase shiny new jam jars at Lakelands and such places…might be a cheating DIY bride ! Hi Kelly, great pastel power going on here and I’m full of admiration for all your DIY projects. I keep having brain waves of projects we (I) could do, and then once we start, the reality sinks in that actually its pretty hard work and I can then see the value of paying someone else to sort it out for me. Yours look amazing though, you obviously have a lot more patience than me! Rum and Raisin is HORRID. We have a cow farm up the road that make their own icecream which is truly the best icecream I’ve ever tasted. My favourite is strawberry icecream or orange sorbet, but vanilla and mint choc chip run a close second. They also do things like honeycomb toffee or chocolate brownie or butterscotch which are too rich for me but the kids rave over them. Yumm!! Great selection of projects! Where did you get the lace from for your jam jars? I’ve been thinking of doing something similar but I’m struggling to find lace that’s both pretty and the right width. Love the jam jars Kelly. I am doing something very similar, but am painting them with different shades of blue (to match my colour theme) glass paint and like you am tying twine around the ‘screw’ bit. Oh with you on the rum and rasin… Gross and wrong! On a similar DIY note, I’ve just started making tiny bunting to use as a table plan – different colour for each table with the names written on with fabric pens – strung over a suitcase and various wooden wine boxes and other odds and ends and with a larger bunting (is that a word when it’s singular?) with the table name on and a hot air balloon (which is our theme). Hopefully it will look pretty! I’m also going to make rings out of scrabble tiles for the girls as favours – inspiration from the RMW gifts post the other day. I’m buying normal metal blank rings from a jewllery-making supplier and then gluing the initial of the person on the top of the ring. They’re quite “novelty” and I reckon most people will only wear them on the day (if at all) but I would probably wear one all the time so it’s worth it for that. Also it costs about £5 to make 50! Love the pastel colours, especially on the tins!! I just had to share these ideas on our page – they’re just what the home-made DIY wedding is all about – creativity, prettiness and gorgeous ideas! Gorgeous ideas, Iove the tins they are so pretty. Your choice of flowers are so similar to mine I love Gypsophilia and hydrangea as they have such big impact without costing a silly amount! Yummy Yummy Yummy the boys just made me a bowl of mint choc chip ice cream!!! love the painted tins & table runners….well done it all looks very professional! flower ideas are just beautiful! 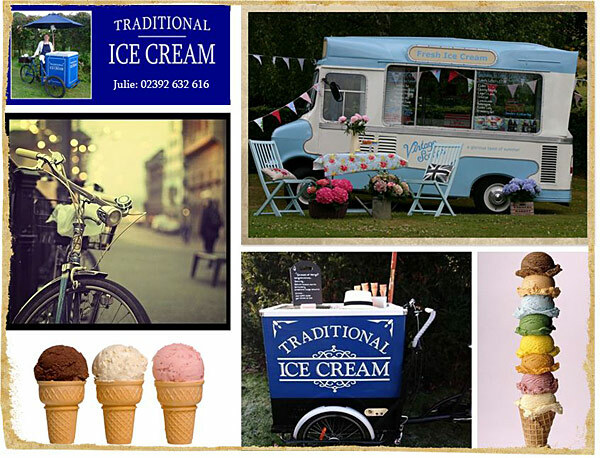 we have thought of having an ice cream van but still deciding….. with my mum & dad paying for meal & canapes i can’t complain too much! I love ice-cream but not sure how much the guests do & wondering if it will just be a waste. Our main flower is Hydrangea’s….they are one of my favourite flowers along with peonies. Which luckily we are getting married in the short season so can have the peonies i love! agree with the cost effectiveness of the flowers. Gyp is so gorgeous and ethereal and is brilliant for bulking out displays at a cheaper cost. @Pamela get collecting and painting. My neck of the woods is also foggy and gloomy, boo. @Caroline I hope you stopped off on the way. You know it wasn’t till after I bought my tester pots I realised that I didn’t have to buy as many i.e. blue + red = purple. Duh! @Charlotte steal away! Hmmmmm I am trying to think of a disguise for you. May come back to that one! @Debi @Anj it looks like the masses have spoken! But I’m glad I’ve found at least two other people who like it. Andys Mum loves Rum & Raisin so think we might have to have it just for her! @Shelley1233 thank you 🙂 My Granny bought the sewing machiene for me and my sis years ago and I learnt to sew on it. Still love it. @Charlotte I like a good olde ice cream debate. Honeycombe yum. I spent a while in NZ and their equivalent is called hokey pokey and it is a BIG hit. Also love ben and jerrys cookie dough. Gosh, all this talk about ice cream is getting me a craving. @Adele congratulations and GOOD LUCK. 2 weeks hey??? You must be crazily excited!!!! I love a freebie and the jars are just great. I want to see yours too and your top table bunting, am planning on doing that too. @Amanda Champness I am enjoying the dark side young Skywalker! I think it would look so cool your guests heading off to the ice cream parlour and coming back with all sorts of tasty treats. In my student days, I spent a lot of time in one of the ice cream parlours in Eastbourne (I can’t remember the name, think it was Italian sounding) and it was way yum. @Annie cheat away! My mum got a bulk lot of jam jars from ebay for quite cheap, it’s surprising how cheap you can pick them up for. @Shirley thank you! I love a bit of a DIY project and even though each tin took 3 coats, I still never got bored! But Andy thinks I am a complete sad case! Your DIY projects though are amazing, give yourself more credit! Ummmmm I wanna try that ice cream your talking about! @Karissa I really want to see your pomander pleasssse email it to Charlotte! It sounds great and not gross at all. @Kim no need to apologise! We’re here to share ideas. Your table plan sounds amazing, again I want pictures of all these fab sounding DIY ideas. @MrsE-finally! Thanks 🙂 I also like your tag name! @Fiona Hogwood thank you for sharing and I tots agree with you. @Maddi I agree, they are great budget busters and look so pretty. @Jenny Lane thank you lovely. Some things look completely naff and don’t work at all, but I try! @Amanda Champness not fair, I want some please! And I see you are being adventurous, who knows what will be next…raspberry ripple?! Loving the pastel tins. The labour was well worth it 🙂 DIY is a funny thing. I tried making some button ribbon hearts the other day for 6 hours and ended up in a crumpled mess on the floor. My fiance then came back from a stag weekend, took one look at me in my pathetic state and then made 5 beautiful ones in a row! Kelly your wedding is going to be so amazing! Those pastel tins are inspired and I am loving the lace jam jars – beautiful! Also love the table names!! 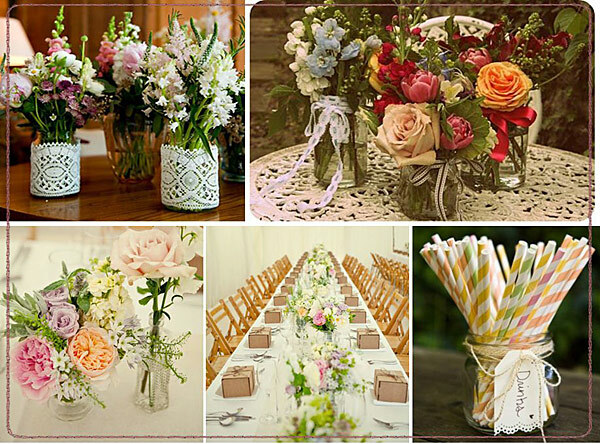 Flowers look fab – love gyp esp for the buttonholes – think it looks so cool! Firstly I am incredibly jealous as an ice cream van would be my idea of heaven although my h2b is right March isn’t exactly known for being boiling and I would get it on my dress! Secondly how has no one mentioned mint choc chip by far the best flavor! I love this post, all your handiwork is gorgeous! Very professional looking. Ive been collecting jam jars for the past month and decorating them in a similar way. Everyone thinks Ive gone nuts (the mother: you want to decorate the reception with what??) so Im glad Im not alone! Hello Miss Reds, my lovely girl. 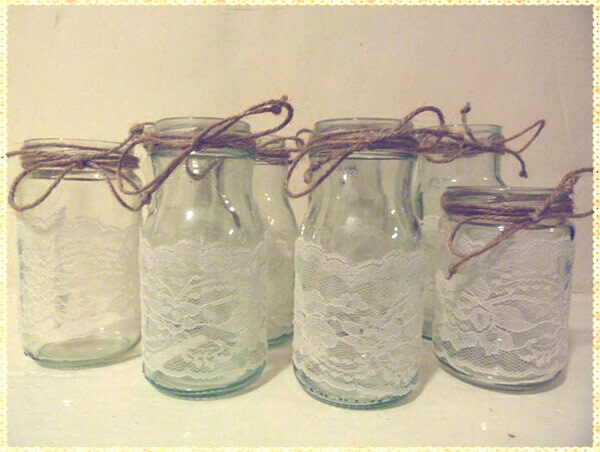 How did you attach the lace to the jam jars? Did you use a glue gun? Can you tell me what app you used for the polariod photos, Ive tried using one and it just doesnt work!